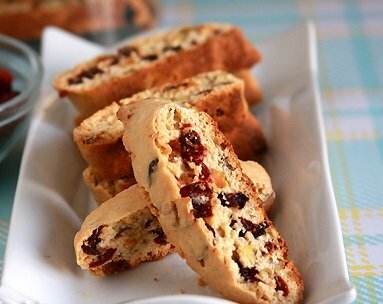 If you like peanut butter cookies, you will love these Peanut Butter Biscotti. They are chock full of peanut butter flavor, due to the amount of peanut butter and the replacement of some of the flour with powdered peanut butter. Powdered Peanut Butter is made from real peanuts that when mixed with water, gives you that thick, rich nutty flavor the whole family will love. It has all the flavor with 85% less fat calories. You might just find that you will start repacing it for any recipe that calls for peanut butter. PB2 is the brand that I use, It’s made with high quality peanuts that are slow-roasted to the Bell Plantations, specifications, pressed to remove the oil and ground into a fine powder. All natural with no artificial flavors, sweeteners, or preservatives. 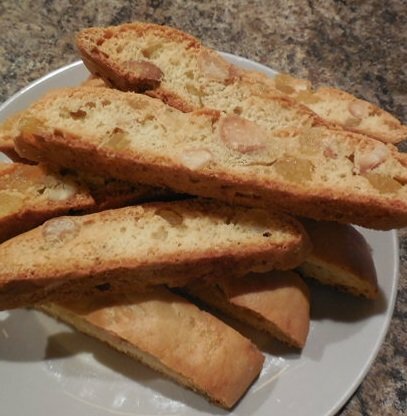 If you want to make a lower fat version of this Peanut Butter Biscotti recipe experiment with substituting Powdered Peanut Butter mixed with water to replace the 1 cup of regular peanut butter in the recipe. Line a large baking sheet with parchment paper or silicon baking mat and set aside. Place one oven rack in the middle of your oven and preheat oven to 350 degrees F (175 degrees C). In a medium size bowl, whisk together the flour, powdered peanut butter baking powder and salt. In a large bowl beat the peanut butter, brown sugar, and white sugar with an electric mixer until smooth. Add the eggs one at a time and beat. Add milk and vanilla extract and beat until mixed. Alternate pouring in the flour and mixing until just incorporated. Fold in the peanuts, mixing just enough to evenly combine. Divide the dough into 2 equal logs and place on parchment paper. Flatten slightly to make a long rectangle shape. Place in oven and bake until firm to the touch, about 25 minutes. 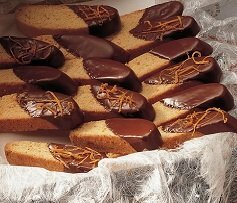 Remove biscotti from oven and allow to cool for 10 minutes or until you can handle the logs. Reduce oven temperature to 300 degrees F (150 degrees C). Transfer to a cutting board, using a serrated knife,cut each loaf into 1/2-inch slices using a sawing motion to avoid crumbling. Return the slices to the baking sheets with the cut sides up. Bake in the oven until biscotti are dry (about 10-12 minutes on each side depending on desired dryness). Remove from oven and transfer to rack to cool completely. If you like you can make these Peanut Butter Biscotti really decadent try dipping in melted chocolate and sprinkling with additional chopped nuts. You will need and additional 1/2 cup of copped peanuts and about 8 ounces of melted chocolate. For tips on melting chocolcate click here! Like these might remind you of peanut butter cups, Uhm!